Most U.S. newspapers worry about the loss of readership and advertising. British newspapers are taxed with something more: a scarcity of ink and paper. 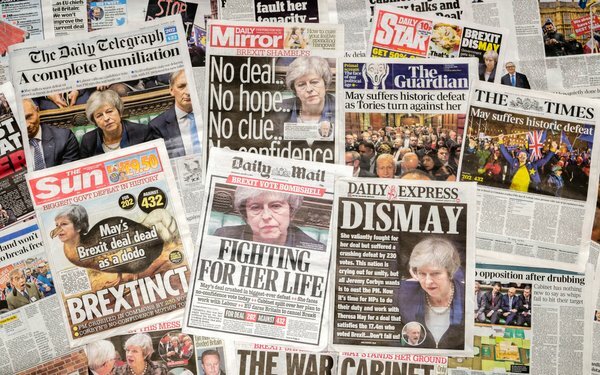 The political chaos surrounding the Brexit departure is impacting UK newspapers. Bloomberg reports British publishers and paper manufacturers are stockpiling newsprint, ink and other essential supplies, fearing the U.K. will exit the European Union on March 29 without a solid deal. U.K. publishers are heavily reliant on key imports: 82% of the nearly four tons of graphic paper used annually by publishers of newspapers, books and stationery comes from abroad. European Union-member countries account for two-thirds of that supply, per Bloomberg. The concern is that potential supply disruptions, coupled with rising prices on imported goods, especially if the pound gets weaker, will seriously impact printing. According to Andrew Large, head of the Confederation of Paper Industries, some trade groups are stockpiling a month’s worth of supplies. Britain voted to leave the EU — Brexit — in 2016; now Prime Minister Theresa May has to navigate an approved exit strategy deal with Parliament, which has failed to date. That's intensifying concerns of newspaper executives.